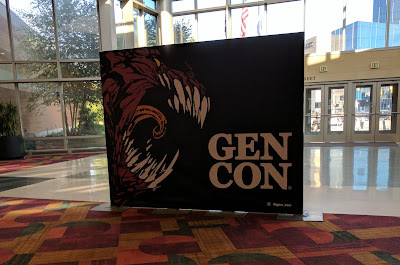 I have returned from the land of GenCon. It was a great time! The inaugural Golden Kobold chibi painting competition was a huge success and I got to meet a lot of folks. Such a great time was had. I left my house and hit the road around 4:30am on Wednesday so I could be there as early as possible to help with booth set up. The 5.5-6 hour drive was supplemented by copious amounts of caffeine, loud music and, in usual Scott fashion, minimal stops. It was somewhere around 90 degrees outside when I arrived in Indianapolis. I found a parking spot in the hotel garage structure and immediately checked in. From there, I went straight to the exhibit hall and attempted to meet up with Ninja Division. Only problem, I couldn't actually get in the hall without my badge and the badges were with my group... inside. After a bit of a wait, I finally was able to meet up with Ninja Division's marketing director, Lawrence Jones and get into the hall and get to work. Overall the rest of the day was filled with a bit more stress than I would have liked. But it was a good time working alongside everyone. Between the early morning and working in the heat, I was almost content to spend the rest of the evening in the room just hanging out. But eventually I decided to wander down to the lobby, where I ran into my friend Logan, who invited me out to Granite City for some beers with his group. The next morning, I made my way to the exhibit hall after the doors opened. After a quick stop to the booth to check on things, buy the new Super Dungeon Explore figures and working out our schedule, I started wandering the hall looking for items on my list. Thursday was a mad house. 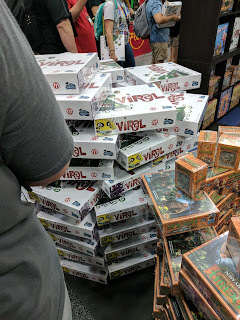 The lines weren't so bad, except when I was picking up Viral at the Arcane Wonders booth which was a solid 30-40 minute wait and wrapped the booth twice. In general, the biggest problem was just trying to get from point a to b, there were folks everywhere and intersections were a nightmare. I did manage to get a lot of my shopping done, in about 2.5 hours. The highlight of Thursday had to be accidentally finding the Chaosium booth. While checking it out, I started talking RuneQuest with one of the guys at the booth, and they showed me a preview edition of the new fourth edition rulebook. When I asked if it was for viewing only, he replied that it was in fact for sale and limited to 100 copies. I immediately jumped on buying up that bad boy, after which he asked if I wanted Jeff Richard to sign it. The answer was so obviously a "yes"! 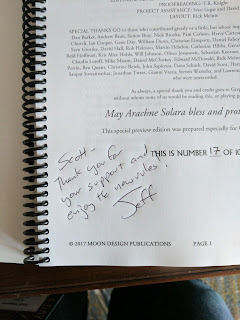 Jeff came over and I got to talk to him for a bit about RuneQuest and how it was my first major RPG game. How I compare it to every other RPG I try out and that we've been playing with the third edition rules since I was about 12. I even mentioned that I have the original Avalon Hill books (which were printed in 1984) in near mint condition. 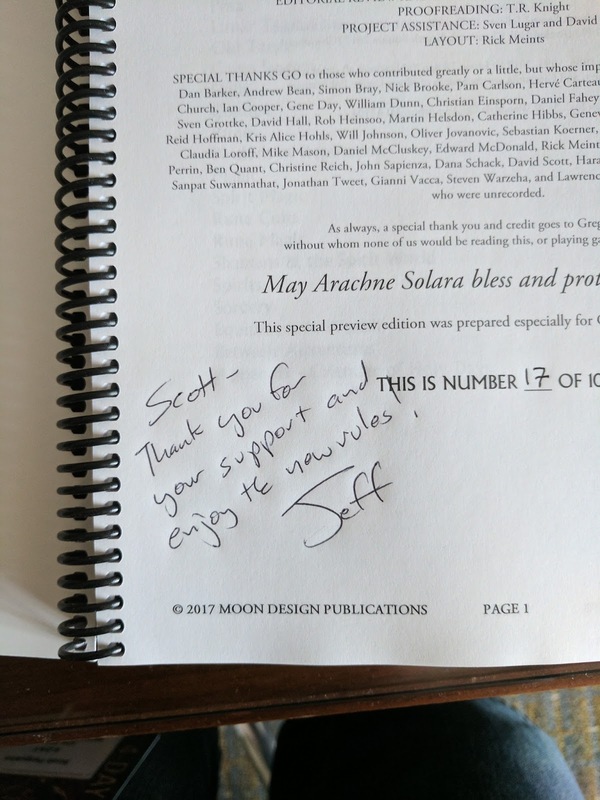 He was really interested in everything I gushed about RQ and signed my copy "Scott, thanks for your support and enjoy the new rules! Jeff". Also purchased on day one were all of the Wander figures for the upcoming game The Cult of Barnacle Bay, Custom Heroes, and the expansion heroes for Too Many Bones. After eating lunch, I started my first shift of booth work and found out that we were going to be working on Ninja Division's new GUTS line of WWII chibis. 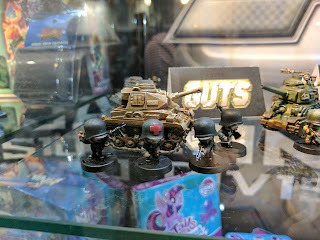 Those guys are adorable and I instantly saw images of Blue and Red tanks being painted. They took a bit of clean up work to get them ready for paint though and most of the afternoon was spent filing and scraping mold lines. Once they were cleaned up though, they were really nice minis, I can't wait for more GUTS to come out. Working the booth was a good time though and by the end of the first day, we had a ton of folks stop by to chat and nearly 30 entries into the Golden Kobold. The amount of entries on day one shocked all of us, and was a huge enthusiasm booster. Thursday night was spent reading rulebooks and Mark Maxey, Drew Drescher and myself all went out to dinner. We spent the evening talking about games, painting and the con in general. Beers were had and jokes told, it was a great time. Friday's routine was much the same as Thursday's. I got up, went down with the rest of the crowd when the doors opened and hit up the Ninja Division booth first to check in with my fellow judges. That day, I made a trip to the Level 99 Games booth to pick up a copy of the new expansion pack for Millennium Blades and got to briefly meet the designer, D. Brad Talton Jr. 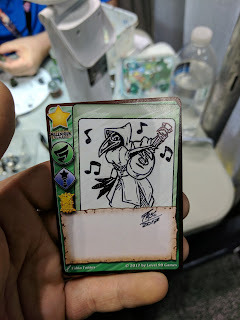 While I was there, I also met artist Fabio Fontes and he mentioned that he was drawing custom cards for $10. 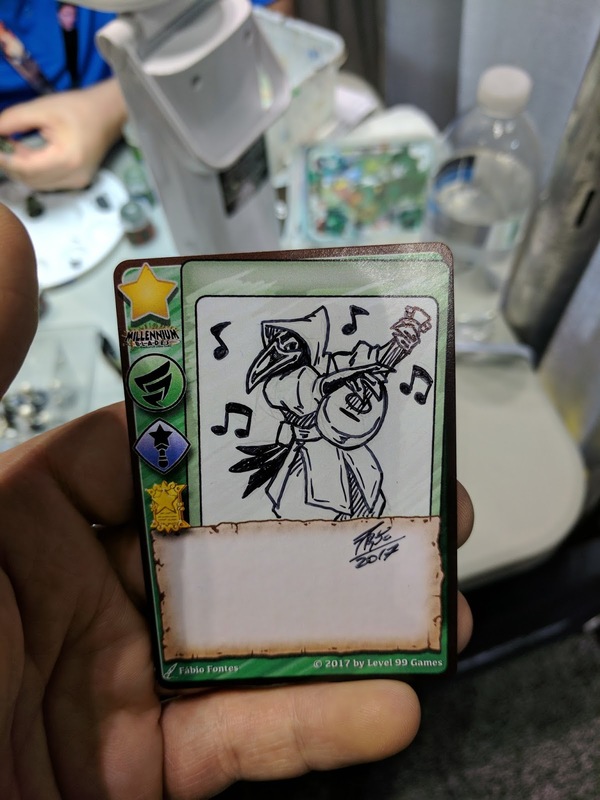 Again, I jumped on that chance, tossed him a tip, and after a bit of brainstorming, we came up with the idea of a Kenku Bard, using a Wind element/Magic type card. It turned out great, and Fabio suggested that if I wanted to use it in game that I can write up a name and effect on it. But, I think I'll just put it in a hard case and frame it, I don't want to accidentally ruin it. That was the only thing I bought on day 2. The rest of the day was spent working the booth, meeting folks who came by and doing more clean up on GUTS figures and finally putting some paint on them. Since everyone else was working on the US soldiers and tanks, I decided to paint up the Germans and started with their Sergeant. One problem I have always had with historical painting, is trying to keep the color schemes legit. I think I ended up Googling WWII German uniforms for a solid 30-45 minutes, trying to find out what the actual colors of everything were. It wasn't til later, I was talking to Dave Taylor while he was visiting the booth and he showed us a picture of various US WWII uniform jackets, all of which where various shades of khaki and green. He mentioned that as long as the color is similar to what we expect them to be, people will recognize which country/faction they are. Another issue I had was that I didn't have my gear with me, and ended up using Drew's brushes and paint, which isn't a huge deal. But it is funny how using different brushes can make you feel like you're fighting yourself. Friday night ended up being the closest thing to a party night of the entire weekend. Drew and I ended up hanging out with some of his friends at the hotel bar, drinking and playing Citadels. Its always fun introducing that game to new people, especially once everyone learns to be cutthroats. I heard later than one of them spent the following day looking for a copy too. The following morning was slightly rough, I ended up with a minor headache from the previous night. But it eventually went away. Elizabeth Beckley and I spent the better part of the morning judging Golden Kobold entries, which took us about an hour and a half to two hours to work through the 30+ models we had collected. While we were judging, we even got a few more entries in too. After lunch, I started working on the German Medic and a couple of machine gunners for GUTS. This time, I remembered to bring my brushes and such with me too, which made life easier. 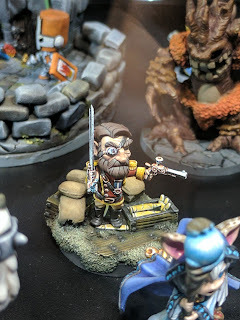 It was fun painting those guys up, and everyone who came to the booth seemed to really like them too. While I worked on infantry, Liz was busy knocking out a Panzer tank as well. We tried to keep them to more of a high tabletop standard, and they all came out really nice. We all agreed, that even with simple techniques and limited color selections, these GUTS figures are excellent. I spent most of the day at the booth on Saturday, talking to folks, giving advice for painting and meeting new people. It was a great time, but by the end of the day I was pretty drained. I'm not sure if it was because I was slighty hungover or just the bustle and drone of the mass of people that it GenCon. Around 7:30-8pm we ended up having a company pizza party with all of the Ninja Division folks. By the time it started dying down around 9ish, my internal battery was reaching 1% so I excused myself, walked back to the hotel room and was crashed out by quarter to 10pm. Sunday morning, I got to work loading up the car early and then wandered around the hotel until it was almost time for the doors to open. This was the only time I was there at opening, and managed to get close to the front. The goal of Sunday morning was to hit up Catalyst Game Labs and snag a copy of Dragonfire and the Gamelyn Games booth and see about a copy of Tiny Epic Quest. I actually was the first person to check out at the Catalyst Game Labs booth and picked up both Dragonfire and the Heroes of the Sword Coast character pack. It seems like an interesting campaign base deck builder. 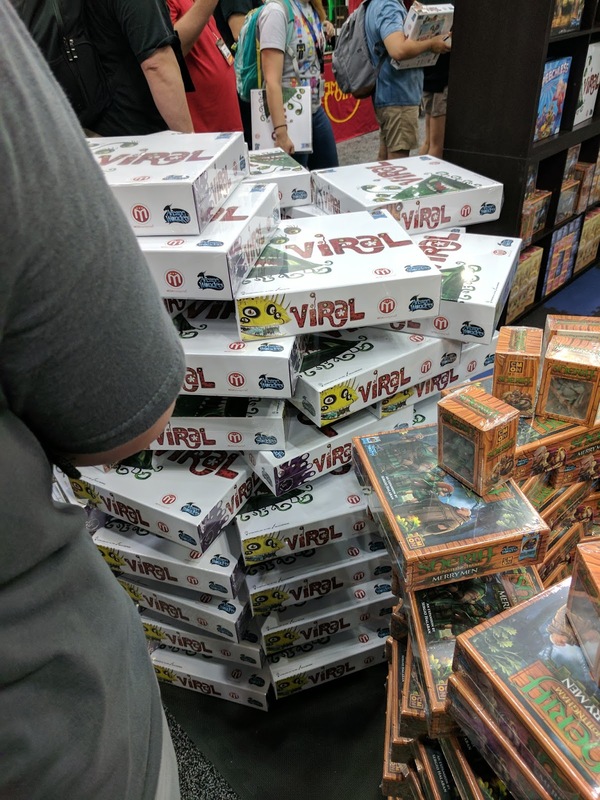 Gamelyn Games was actually sold out of Tiny Epic Quest, but they had a deal to get it directly from their website for the same price and with free shipping. So I snagged a copy there and am currently waiting on it to arrive. 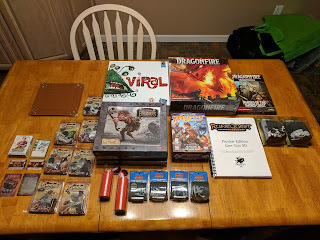 I ended up with a pretty nice haul of games and minis by the end of the weekend. But now I need more shelving to store it all. There were a lot of great entries, and it was tough picking the best of the best. In the end, Ian Markon walked away with the Soda Sword for his Scale 75 Colonel for best of show, but it was by a very tight margin. That Soda Sword was pretty amazing, and HEAVY. The craftsmanship was great and they even built a custom storage box for it too. I was really impressed with it and everyone wanted to take a look at it. Marie-Claude was worried about her painting job on it, and said that she was worried that the winner would judge her paint job. She even said "she's a seamstress, not a painter, don't judge me too harshly". 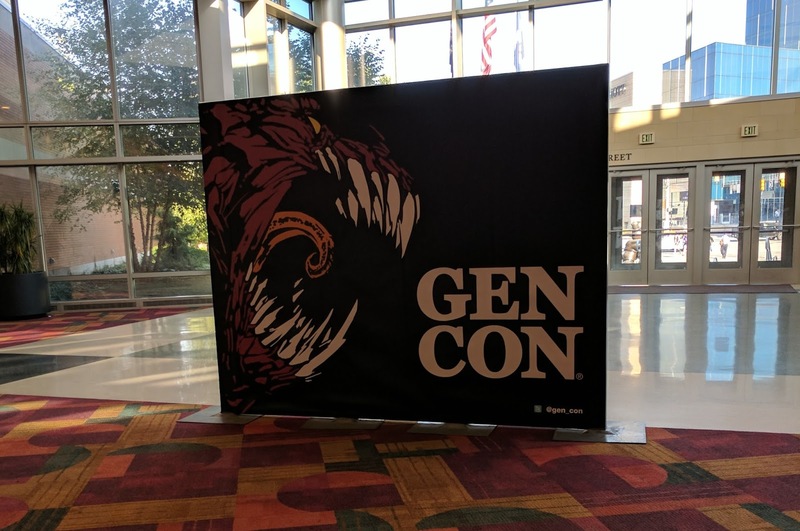 The exhibit hall closed at 4pm on that Sunday and my GenCon experience came to an end. It was a great time! Old friendships were rekindled and new friendships formed. 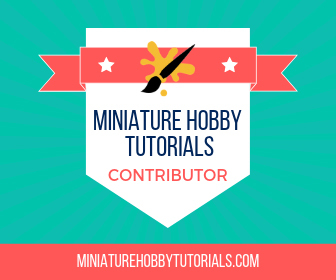 I was able to help guide newer painters with advice and recommendations, as well as talk shop with a few industry insiders. I'm proud that I was able to do my best for Ninja Division and help shape the Golden Kobold, which from the sounds of it will be returning next year! It was an honor working with everyone at the booth, and I can't wait to see them all again. Last but not least, I want to say thanks again to my fellow Golden Kobold judges and new friends, Drew Drescher, Elizabeth Beckley-Bradford and Mark Maxey. You guys were a joy to work with and I had a great time hanging out and getting to know you all. Nice write up. Thanks for sharing. Thanks and you're welcome. It was a great time, and now I can't wait to see all my con going friends at next year's Adepticon.